It's been quite the few months for Leonid Markin. The Russian hadn't even played a live tournament prior to June of this year. 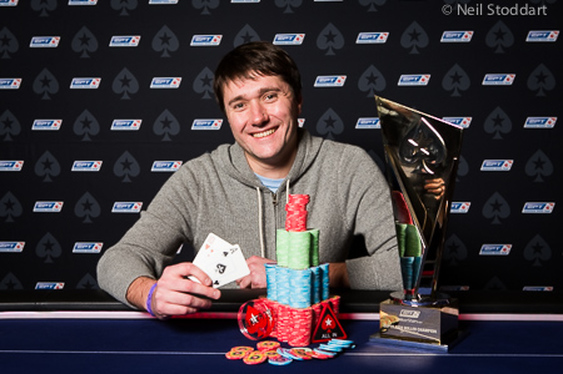 Now his live earnings stand at over $1.2m, thanks largely to yesterday's €50,000 EPT Prague Super High Roller triumph. The man from Siberia topped a 51 entry field in Czech capital to walk away with €771,360, by far the largest score in his fledgling career. Seven players started Thursday's finale hoping for that bumper pay day with Brian Roberts, the first to hit the rail. The last American standing began the day in chip and a chair territory but a couple of early double ups offered renewed hope. Those were soon dashed by Birmingham's Paul Newey whose kings were plenty good enough to see off Roberts' Q3. Vladimir Troyanovskiy was next to go, this time at the hands of countryman Markin. Fellow Russian Ivan Soshnikov soon joined his compatriot at the cashiers' cage after running his pocket tens into Newey's kings. After Finnish veteran Juha Helppi busted in fifth it was left to Markin, Newey and fellow Briton Stephen Chidwick to battle it out for the bumper pre-Christmas bonus. Chidwick finished third in the EPT Prague Main Event and the Prague leg of the Eureka Poker Tour in 2013. He now has a third place finish in the Super High Roller to add to his collection. Short stacked after running pocket nines into Newey's aces, Chidwick took a stand with Ks9s. Unfortunately it was Markin who held the rockets this time, condemning the Englishman to another near miss. €355,070 should offer plenty of consolation. Markin took an early lead in what proved to be a cagey heads up battle with Newey and eventually prevailed after an ace over ace confrontation. The final hand saw Markin raise to 480,000, Newey pushed with his final 4m and the Russian snapped him off with As10h which held against the Englishman's Ad7d. Newey wasn't too disappointed which his runner-up finish. He told the PokerStars blog, "I've made the final table in three of the last four Super High Rollers that I've played: here, the Big One for One Drop and one at the Aria. They say the only person who's happy is the person who wins the tournament but I'm happy with second." For more on businessman turned high roller Paul Newey's meteoric poker rise, check out our interview in this month's Bluff Europe.